Commercializing poplar-based chemicals for everyday products, like plastics and textiles, could form the bridge to biofuels. 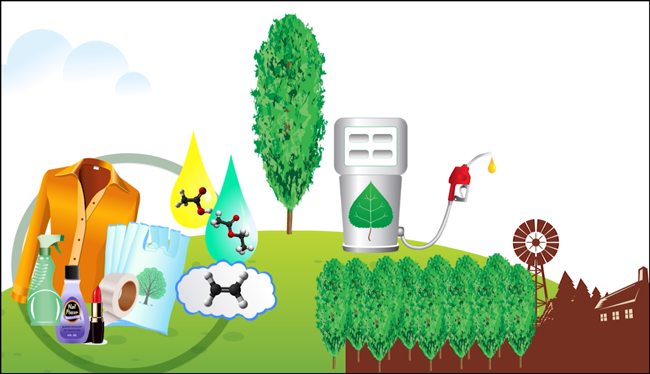 AHB is developing cellulosic biofuels from poplar trees, including ethanol and drop-in fuels. Cellulosic biofuels are fuels made from non-food crops or agricultural/wood residues. Cellulosic biofuels production is more expensive and complicated than using starch- or sugar-rich feedstocks (like corn) because it is harder to access the plant’s sugar. However, cellulosic biofuels can be more environmentally and socially sustainable. Given the economic challenges presented by cheap petroleum fuels, other bioproducts may form the bridge to a future biofuels industry. The petroleum industry is also built on a business model of profiting from off-takes in addition to fuel. In particular, AHB is exploring high value bio-based chemicals that can be used to make a variety of everyday products, like paints, plastics, and road deicer. For example, organic acids are made during the conversion pathway to biofuels. AHB has explored acetic acid, lactic acid, and other chemicals.